The busier I get (and the more kids I have), the more STUFF I seem to accumulate, and the more desperately I long to live a life free of clutter. While I don’t think I will ever be considered a minimalist, I dream of a home that is pared down to just the essentials—only those things I love and use on a regular basis. I dream of order and organization and simplicity, of fewer things and less stress, and of more meaning and greater purpose. 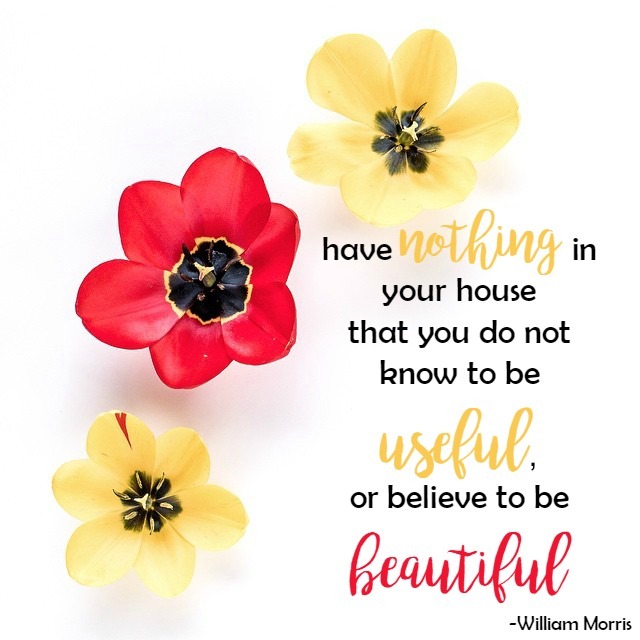 Everything must have a home—Clutter most often piles up because we don’t know where to put it, so it goes to follow that one of the biggest keys to conquering clutter is ensuring that every object has a home. If it doesn’t, it goes out of the house. Everything must have a purpose—Too often we keep things because they were a gift, or because they were expensive, or because we feel like we have to. We may need them someday, right? The truth is that keeping items in our life that have no purpose just gives us more to do. Everything must be in good working order—If it doesn’t work it is time to either fix it or let it go. Broken items only add additional stress and chaos to our lives. Everything must have a label—It might seem like overkill at first, but labels allow not only US to know where things go, but let everyone else know as well. In a family, this is pretty essential. Once we give our items a home, we must give their homes a label as well. This makes it easy to hold the children accountable too. If it needs to go, get it out FAST—When things sit around in a box in the garage or in your car trunk, they inevitably make their way back into your home and your life. As soon as you clear a space, make sure to finish the job and actually get the clutter out of your home. Have a yard sale if needed, but do not hang on to anything for more than a few days. Prepare your mind. Mentally commit to the process of letting things go. I know it is hard to part with things, but you will appreciate the mental clarity that comes from a de-cluttered home. Prepare your family. Let your spouse and children know that change is coming and that you plan to drastically purge the clutter that is currently weighing you down. Let your kids know that if they have things they don’t want to lose, they will need to find a home for them. Discuss with your spouse what kind of changes you are both comfortable with so that you are on the same page. Keep your family as involved with the process as you can. My husband is eager to do this this with me, which I know will make all the difference. I told my kids this is a chance to give to kids less fortunate and they are already planning which piles to give. Prepare your schedule. Reserve 15-20 minutes each day this month to focus on this challenge and to complete your assignment. Block out even more time on the weekends to get caught up and to sell or donate any items you are getting rid of. Remember this is only 31 days. Prepare your supplies. Gather the items you will need to complete your assignments—boxes for collecting the items you plan to get rid of, a camera for taking photos of the things you plan to sell, and a label maker for labeling everything. I recommend a few bins- trash, donate, keep. Prepare your space. 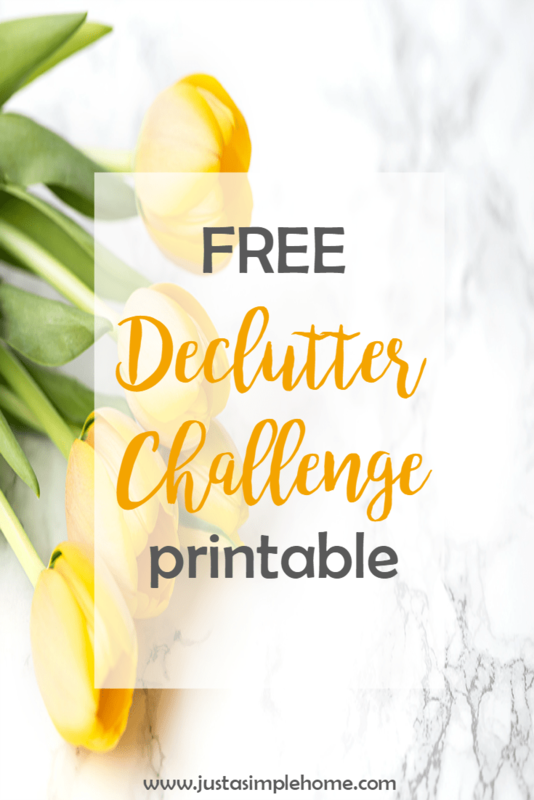 This challenge is about de-cluttering, so we will not be spending time on cleaning your dishes or doing your laundry. Try to catch up on your day to day chores, or even get ahead, so you can start with a relatively clear space. Don’t forget to share to use the hashtag #SimpleHomeChallenge on Instagram and Facebook throughout the month! I would love to see what everyone is up to! I like the prepared list. Prepare Your Family is priceless and so true! No need to go down the path of an uninformed family! This is such a good idea and those are great rules to keep in mind! I’m pretty good at de-cluttering but somehow more stuff always sneaks it’s way into my home when I’m not paying attention! Thanks Nellwyn! I am pretty excited about it! Such a great list, and preparing is definitely key. Love the free printable too! I would like to be this organized…but I’m just not there yet, lol! This week is cleaning out the cupboards and pantry. Last week we cleared out all the books we weren’t wanting to hang on to. Bit by bit! Books is a huge one for us to! We even have piles on floors. Every little bit counts! So looking forward to this Declutter challenge. I so need it as do my cabinets and closets. I am glad you are joining in! Be sure to print out your calendar. Aww, sorry about that Rese. I know it can be hard when we aren’t on the same page as our spouse. Maybe try printing out the calendar and show him that it will only be a few minutes each day? You will be getting rid of things, but it will be a gentle method. I half joked to a friend that it would be easier to move than sort out the garage. I really want to make it a priority this summer though, thanks for sharing these tips! I have so much clutter in my house. I really need to go by this. We just accumulate so much stuff! Hope you can join in, Amber! My most difficult part of decluttering is “everything have a home”. I just get stuck with where should I put this item? I have a whole loft area which could be a great playroom and it is just so junky. I need to get to work. You should join the challenge Carolyn! I think you’ll be motivated to get that playroom organized. We seem to be accumulating stuff faster than I can declutter. It’s always work-in-progress! I love your ideas! Thanks for the free printable!!! This is such a good challenge! We try and declutter, but it seems like the minute a toy (that seriously hasn’t been played with in months) gets placed in the donate bin, it becomes something my son “can’t live without” (even he’s often the one that first says he’s OK to let it go). It’s amazing how much you accumulate when you have small children. Yes, I hear you! We have been preparing the kids for a little while now. But the other thing we have done is use a closed bag t get rid of things- that way they don’t see what is leaving once it is in the bag. My home is so cluttered right now it drives me insane! I hate it! This will be a big help in getting me organized! I’m all about decluttering and simplifying — there is just too many things to do everyday to constantly be sorting through things and cleaning around stuff! Thanks for the printable! This is a great challenge. Preparation is the key for this to become a success! This is a challenge that I need to do. The rules will really help me to let go of some things that I have been hanging on to. I agree so much with getting it out fast. If I let it sit around it ends up back in our house every soon! I think these are such great tips! I especially like the “everything has a home,” so there isn’t just random stuff just scattered throughout the house for no reason. These are some awesome tips! I do the same things for myself when I’m cleaning out a space! Even though we had a 3-day holiday and we went to a road trip, I managed to use my last day of the week-end to do some de-cluttering. I started with the one I dreaded the most…decluttering paperwork, old bills, files, etc. Uuugh! At least I got that out of the way. Good for you! That is what we started with too, because it is the most dreaded task! It just seems to pile up despite our best efforts. Hope you check out Day 1! I can’t wait to try this! I always feel like I’m downing in clutter and we really just don’t need so much of the stuff we have accumulated. I love the idea of decluttering, but then I somehow end up keeping all of it. I need help! This is a great post for me. Oh no, lol! You just need to start, that is the hardest part. Once you start, it feels so freeing! I just want to get rid of everything now.